The talks will take place in the Teatro at the Italian Academy. The Italian Academy is located in New York City at 1161 Amsterdam Avenue, between 116th and 118th Streets. The entrance to the Academy is on the east side of Amsterdam Avenue, and the doorway inscription reads "Casa Italiana." Parking: Information can be found here. 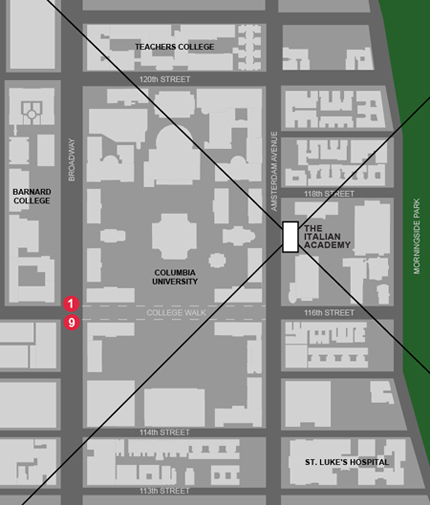 Subway: Take the 1 to 116th - Columbia University, and then walk east one block through the Columbia University campus. Bus: Take the M4 or M104 to 116th and Broadway, and then walk east one block through the Columbia University campus; or take the M11 to 116th Street and Amsterdam Avenue. The afternoon panel discussion will take place in the Presidential Room at the Faculty House. The Faculty House is located on Columbia University’s East Campus on Morningside Drive, north of 116th Street. Enter campus through gates at 116th and Broadway. Follow College Walk across Amsterdam Avenue towards Morningside Drive. After passing Jerome Greene Hall on the left, enter Wien courtyard through the gates. Follow courtyard around to the right. Faculty House will be the last building on the right. Subway: Take the 1 train to the 116th Street - Columbia University stop. View a list of local lunch options. View a list of local accommodations.